Samana is located in the northeastern part of the Dominican Republic and offers many exciting activities and unique adventures. The town is a scenic and peaceful port with friendly Dominicans living their lives set to the rhythms of Merengue, Bachata and Salsa music. Discover underwater wonders at excellent dive sites, capture the vibrancy of the sea while snorkeling, practice your rock climbing skills or enjoy horseback riding along beaches and through jungles. Whale watching in Samana is also an experience not to be missed. Every year, from January to March, humpback whales migrate to the waters of Samana, offering a spectacle of true wonder. Samana is graced by a newly renovated Malecon — a seaside walking promenade — perfect for daytime or nighttime strolling by the breathtaking bay and marina. You will also find many restaurants, bars, shopping and terraces with Wi-Fi in town. Visit Los Haitises National Park, where you can explore mangrove swamps, islets, caves and other natural attractions which include: the Salto El Limón Waterfall and the Paraíso Caño Hondo eco-tourism project. Come discover this amazing paradise for yourself. Once you arrive at this eco-paradise, you won’t want to leave. 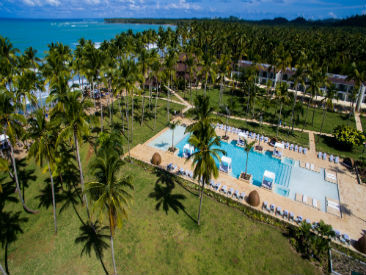 Your Viva Wyndham V Samaná vacation will offer days full of active adventure, freewheeling fun and pulsing nightlife. Your room is the ultimate, ultra-comfortable sanctuary to rest and recharge. Complimentary Wi-Fi will keep you in touch with social networks. Room design is defined by simple, stylish furnishings and locally inspired décor. All rooms feature pool, garden or ocean views and an array of in-room amenities.